God then covers Miriam’s body with leprosy. When Moses cries out to the Lord, “O God, pray heal her!” he heals her, but only after she’s shut out of camp for seven days. God, again, is disappointed in the lack of faith by the Israelites in his abilities. Since the people wanted to return to Egypt, he let them travel South. 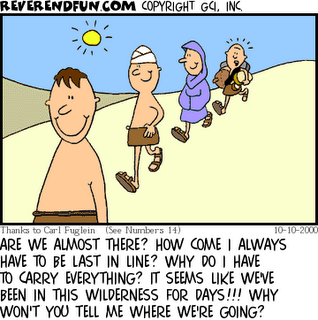 The Israelite people wandered for 40 years. 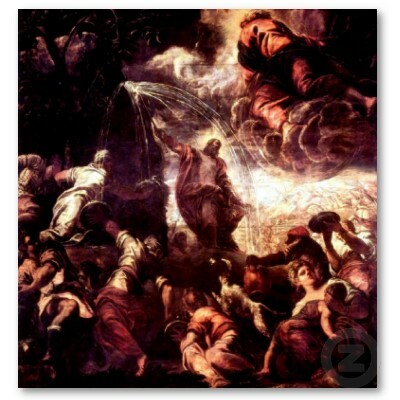 In Numbers 20, Moses breaks under the pressure of being the leader of the Israelites. As they complain again, he and his brother ‘fall on their faces’ instead of defending the Lord. As a result, Moses will not be allowed to enter the Promised Land. Harsh? It seems so, but as a leader representing God, Moses has a huge responsibility to teach what it means to have faith. Leadership is not to be entered into lightly. What I can gather from just these few stories, is that having FAITH in Christ should be a priority for all who believe in Him. That He will guide you through any obstacle as long as you have faith in Him. Why is it that people are so easy to lose faith, even when something so large is at stake? It is a characteristic that is still found abundantly in so many of us today. Why is it easier to lose trust in someone than it is to learn to trust in them? On the other hand, How is it that God, the man who forgives us of all our sins, is so quick to punish people? Why does he do so so strictly? This entry was posted in Class Discussion and tagged Bible, Book of Numbers, Faith, Moses, Old Testament, The Promised Land. Bookmark the permalink. Go back and read the first couple posts on this class blog and recall that the goal of our interpretations isn’t to derive moral lessons for how we should live our lives in orientation to some personal faith. Instead, how can we read the story in Numbers apart from the specter of Christianity? Being someone with no background in reading the Bible, I accidentally ‘dragged’ the term Christ into my writing when, what I meant, was God (my mistake.) I was simply writing what was going through my mind as I was reading the book of Numbers. It made me reconsider my life personally, not only in a religious sense but also when it comes to people in general and my faith in them. This is a great idea. You have thought of many examples and shown how they are invovled within the narrative. I think lesson one however is a bit off. The story of the quail I see as a “be satisfied with what the lord has given you and don’t be greedy.” God had been providing them with healthy, and adequette food as they wandered in the wilderness but they wanted meat, a luxurious food in antiquity. If God felt they needed meat, they would have had it.